Thank you, everybody. Pilgrim is the name of the butternut variety I bought. I went looking, and found a site with photos of a butternut that looks like mine (scroll to the bottom.) Well, yay, that is definitely encouraging! So hopefully the coloring is just an idiosyncrasy of that variety and it really will be what we want and not an offspring of the gourds next door. Our Vermont maple syrup and butter wait in happy anticipation. I should mention, the wateriness in yesterday’s picture is because I steamed those two halves in the microwave, trying a little too hard to soften the ends. The critters have stopped raiding them (they made off with the first two) since I guarded the edges with those thorny stalks mentioned earlier; we now have two new and one fairly large one in among the leaves. The plant is nearly twice the size it was two weeks ago and I expect there will be more squash to come. Monday, I will ask Burpee. And hope. Mystery plant solved. I think. I had to know. I had to know what to do with them, leave them growing or harvest them small, so I finally cut a little one off and opened it up. My squash seedlings got eaten as they came up a few months ago so I set out some much-anticipated Sharlyn melon plants in the same spot. Three times. And the squirrels devoured them all–except that last one. Clearly it was a new squash plant coming up late from the earlier seeds, because this is no melon. Butternuts grow like this and turn washed-out-yellow later, right? Or is this yet another squirrelled volunteer? Because I know my neighbor on the other side of that fence grew gourds at least one year and I have no desire to commit my water to growing those. 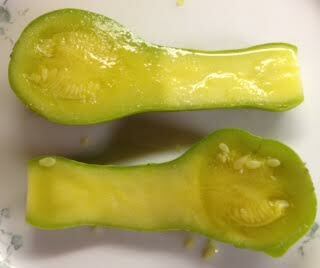 It tasted sort-of zucchini-ish but was already a bit hard in the handle end. 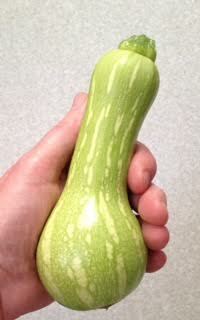 Any experienced gardeners reading this who’ve grown butternut? He didn’t get to draw Cul-de-Sac for enough years. But I’m so glad for how he saw and what he gave us in the time that he could. A hawk, possibly a Sharp-shinned or maybe even a Cooper’s, circled close overhead as we sat in the rental car in front of my father-in-law’s a moment this morning and set the GPS for the airport. And again as if tracing the cul-de-sac in the sky. As we pulled out, it went ahead of us a bit and circled one last time in good-bye and then away, and I exclaimed to Richard that it was the perfect ending to our visit with his dad. It had been *so* good to see him this past week and the hawk coming so close was like a connection between Texas and home, a sense of till-the-next-time. On the flight leaving Dallas before ours, there was a family–a dad, a mom, two little girls about four and five and a baby–who got to the gate just in time to preboard but it was clear it had been a hustle and a hassle making it at all in time and they were stressed. Their flight was late, which had helped a lot. The dad was trying not to be cross. But his face gave him away. It was a risk… I didn’t want to be putting him on the spot and I didn’t know how he would react when all I knew about him was that he was not feeling overly charmed by his cute little girls in just that one little moment. But who would want to be judged forever by those public moments when you’re not the perfect parent. I wavered. But by then I’d already found two cute ones in the depths of that purse and they spoke for themselves: these were, first and foremost, for the parents. A pink flamingo with black beak and eyes and a black condor, the tips of its wings and tail edged in white. Meanwhile, the guy looking at their boarding passes was finding something not immediately right and making them stand there and stand there and stand there while everybody else was waiting to go on that plane (no pressure!) and what that did was create a sense of anticipation while giving me enough time to get me over my fear of reaching out. So there you go. “I wish, but no, I buy them from Peru but they are hand knit. We’ve had little ones,” I smiled, nodding at their children, who hadn’t caught on yet that these were for them. They thanked me again and it was like that was what the no-nonsense airport guy needed to be done with them and he sent them on their way past the gate. As they headed away I was relieved and glad to have seen the best in both parents having immediately come to life. That was the gift they gave to me. The Democrat in the room heard a not-a-Democrat say, Now there’s a man who speaks with conviction. One of my sisters wants a black cowl, and I figured that if my eyes were going to be working in black it was going to be a yarn that of itself made me want to work with it despite the difficulty in seeing the stitches. Plus, this was my sister; I wanted to make her something really nice. And so I bought the last two skeins of black Woolfolk that Purlescence likely will ever sell. I finished all but the cast-off as the plane landed Friday–if I were going to stop at one skein, and it would have been a very nice if smallish cowl. Given the iffy lighting on the plane and the splittiness of the yarn, this was very tempting. Tonight, though, I finished it the way I wanted it done, after using up as much of the second skein as possible. My father-in-law was in the middle of Facetime talking to our niece and I showed it off for her briefly–I was really proud of myself for persevering and doing it right: generously sized, thickly knit, and warm as well as soft against the northeastern chill. And that yarn really, really is soft. A cousin got an earlier one-skein wonder out of Woolfolk and couldn’t believe it wasn’t cashmere? Nope, merino, plain and simple. Matter of fact, Deborah’s ecstatic reaction was why I bought more. I put it away, Dad continued his chat, and afterwards he asked me, What did you call that? A cowl. Or sometimes, an infinity scarf because of its being round. He grinned: Looks like a bib! When we laughed, he added, Or a hoodie. (But not wanting to waste the opportunity for a good tease, he went back to) A bib! Like, y’know, you eat lobster with! Me, laughing: Can I quote you? Actually? Lobster would be a dish worthy of such a thing. Lynn picked me up and we went to the new yarn shop in town, West 7th Wool, where I picked up a souvenir skein of Malabrigo Rios and she, some Findley. We had such a good time catching up. Then tonight I went to go answer everybody and found my mail had somehow disappeared from the laptop and it just wasn’t coming back up in any way I could figure out. Huh. I handed it over to the resident geek, and as he handed it back a minute later he remarked, You haven’t used this in a long time. It was at a thank you note from his late wife for the chemo caps and there she was, wearing the light lavender one. A silent, upwards, thank you, Mom, as he took in his beloved’s face again. I forwarded him a copy. Found my laptop last night! After being dead for months, we had it set up with the new charger at the outlet just past my stash closet so that I would always always look there first. Which is how it disappeared for two weeks. A quick Cooper’s hawk report: one landed on the fence and watched me today like old times–warily, but it did. I loved it for coming and as I felt that, he suddenly relaxed and fluffed out his feathers and took in the day, and a fine day it was. It was so cool seeing him so at ease. But after finally getting him to come back I’ll be deserting him by not filling the feeder. Richard mentioned that we should pack an umbrella. There was this Californian moment of oh…! I remember those! (Haven’t used one in years)… (Running and checking the Ft. Worth weather report again. Ours, 79F, theirs, 99.) I remember the surprise from the first time we went there that the oranges and juice were so much sweeter in Texas for the heat. We are off in the morning to take care of his dad. The house will be sat, the tomatoes ripening. If you don’t hear from me, the plan is also that Lynn there will be taking me to sightsee West 7th Wool yarn shop Saturday afternoon. Sweet will be the times spent. I saw a flyby in the morning, which was cool, and this evening, Richard looked up at hearing a finch hit the window–just in time to see the pursuing hawk hit it, too. But…but…! As I remembered the time I washed the windows and Coopernicus arrived right there a couple of feet away and examined closely: yes, there’s still something there, still in this particular space as always, okay, got it. He would circle within an inch, absolutely amazing to watch, clearly knowing exactly where that plate of glass was. The fact that today’s Cooper’s hawk flew back out of here was a relief. But also a reminder that that particular species is often found by biologists to have evidence of healed broken bones. It dawned on me this afternoon. The dolly had been in the garage. The male Cooper’s hawk has always liked to perch on it on the patio, but it hasn’t been there the last few months and I hadn’t even thought about it. We used it a few days ago to wrestle a very large hand-me-down ceramic planter given to us by a friend who was moving back East, and as long as we had that thing out I’d left it in its old spot for now, a little wistful at the memories of seeing my favorite raptor on it. And there you go. The hawk came back. So there it stays. Meantime, when my folks had their hands full with small children, they were living in a very small house and four daughters in one bedroom was getting tight. They bought a lot in a new neighborhood starting to go up, and two of their old neighbors liked it enough that they came, too and so the three families settled into their bigger places still just a few houses away from each other. One was Wendy’s family, and so she and I have known each other since we were born. She lives in New Jersey these days, and she and her husband were briefly in town. They met up with us at the airport before their flight tonight and we were very glad for there being a Starbucks outside the security line where we could sit and catch up a bit. Tomorrow they’ll be in Philadelphia where her folks live now–at the same time two of my sisters will be in that town from out of state, and so they’ll get to see each other, too, and I’m so happy for them. I’d love to be able to thank Mr. and Mrs. B in person for being my backup parents all my growing up. There’s nobody who knows you like the ones who have always known you. I did a quick glance for the camera but it was across the room. It had been awhile since I’d seen the Cooper’s hawks, not even during summer solstice when they’ve always shown up in years past, but one of them more than made up for it today. Those wide wings swooped right around the birdfeeder and near the window as the doves made a frantic run for it. I didn’t realize he’d caught one and as I stood to look over the philodendron to see if he was still in the yard I startled him into flying away with it. Part of me wondered if it was Coopernicus’s offspring and doesn’t yet know that we like to people- and bird-watch each other? Still, I should have moved a little more slowly. All I had to do was wonder if this were still Cooper’s territory to have them announce that yes, thank you, of course it is. Fuji apples and Black Jack figs (which are a lot harder to get clamshells around.) The end of summer is going to be wonderful. One stick in the dirt, one year, fifty figs. Sweet. And the first of my tomatoes started turning color today. A raccoon apparently tried to get at it last night but stopped after starting to move one of those thorny stalks (see yesterday) that was in its way–and that was that. I cut more of them down and added extra around the tomatoes and the fig tree both, liking that the lesson seems to have been learned and wanting to reinforce it. The leaves are nearly gone for the season and most of those 5-7′ flower stalks have dried. The hummingbirds love the blossoms, which is a large part of why I haven’t gotten rid of them, but those stalks (just the stalks) have these vicious jags of thorns everywhere and every summer I start thinking I should just rip out the lot of them entirely. So how many years did it take me to figure out that the critters that raid my stuff wouldn’t like to touch those any more than I do? All those times that I carefully cut the stalks with clippers and tried to keep holding onto them in the jaws of the things as I carried them to the bin, ends swaying awkwardly, trying not to let them smack into me as I opened the lid and tried both to get them in and to cut them in half so they would fit in there–they always got me. Often in the face. So I challenged the squirrels and raccoons to a duel: En Gourd, villains! The tomatoes have the spiky things too. And they are untouched. So far.